13 Feb 2016 – Are we standing on the precipice of a major financial collapse? I’ve become somewhat obsessed over the past two years with economics and monetary policy, not because I am money-crazy, but because I firmly believe a 1929 style market crash will usher in an area of pain, and I want to be ready for it. In this post, I will present several trigger factors that could set off such a crash event and then what the powers that be are likely to do in the aftermath that would affect every man, woman, and child in the developed world, you included. Finally, I’ll offer some measures you can take now to help yourself in the future. These are all topics that have been absolutely flashing red in my news feeds over the past 1-2 weeks. There is a huge laundry list of leading economic indicators I could point you to for visualizing the sick economy, but perhaps the king of all leading indicators is the price of oil. It has absolutely cratered in the past year and a half. It’s gone from well over $100 per barrel to now hovering around $30 and flirting with the idea of going lower, a 70%+ decline. 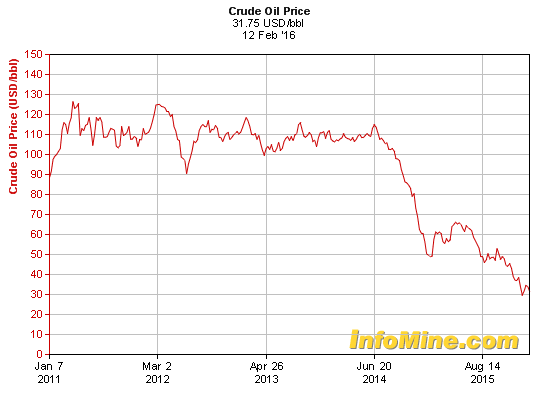 Now why would oil drop in price so dramatically? Is it because the Saudi’s are trying to drive the American shale industry out of business? No, it’s much simpler than that. People simply don’t need as much oil because they aren’t producing enough goods because there aren’t enough people willing to buy those goods. When demand dries up, sellers are forced to lower prices to entice buyers to keep buying. With oil becoming increasingly expensive to extract from the Earth, oil companies have taken on excessive levels of debt to finance their drilling operations. It may have made sense to do this at prices over $100 per barrel, but certainly not anywhere below that, let alone at $30. Now many oil companies are facing bankruptcy, which means many banks won’t get all that money back. What all this is adding up to is the simple fact that the banks will not get back all of what they are owed, and the world is starting to figure this out. The problems will first manifest themselves on the edges and work their way inwards. Take Italy for example. Shockingly, over 16% of the entire country’s borrowers have stopped making payments on their loans. This is huge. Given that most banks don’t keep any more than 10% reserves, this means that if 16% of their assets go bad then they are basically bankrupt. With how interconnected the global economy is, don’t think banks in the major economies such as the US are immune to such a contagion. If you’re an American or if you don’t follow finance then you probably don’t know anything about that bank and why it should worry you, but you should. It’s arguably the most important bank in Europe and its derivatives exposure is literally 20 times the entire size of the German economy. 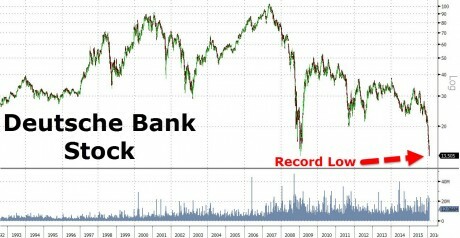 In the words of Jeff Berwick, “A Deutsche Bank collapse would set off a worldwide banking contagion that would make Lehman Brothers look tame.”  As a memory refresher, the collapse of Lehmen Brothers in 2008 helped usher in the so-called Great Recession that we’re still recovering from today. It was reported this morning [9 Feb 2016] that the bank’s CEO released a memo to employees in which he assured the “troops” that everything was fine. Most people do not remember this but I’ve been cursed with a great memory for certain details. Jimmy Kayne, the CEO of Bear Stearns, when Bear blew up gave the same type of pep talk to Bear employees shortly before Bear was flushed down the toilet. Reaching even further back in the annals of epic corporate fraud induced collapses, Ken Lay gave the exact same kind of pep talk to his people right before Enron collapsed. Suffice it to say that the executives at Deutsche-Bank have told people “everything’s okay” so many times in the past couple of weeks that it’s almost proof positive that something is indeed horribly wrong. I would be remiss if I left out China, which has also been flashing across the news feed over the past two weeks. It’s well known that their economy and stock market has been cratering. This caught many people by surprise but if you consider the fact that their country has been building entire ghost cities with nobody living in them, and paying for it with astronomical levels of debt, then it shouldn’t have come as any surprise to anybody. One thing from articles I read this week though that caught my attention was that the “Big Short” guy, Kyle Bass, is now calling for a complete implosion of the Chinese banking system within five months. If the banking system supporting an economy the size of China collapses, you better believe the rest of the world is going to be dragged down right with it. The take away here is that there are a lot of things that could become triggers for a large economic crisis, and one must remember that it’s not important what the trigger is – the important thing is that the system is so fragile that any number of triggers could bring it down. Will it be the simple fact that the economy is tanking? Will it be that the low price of oil sets off a massive chain reaction of bankruptcies? Or will it be that Deutsche-Bank or some other major global bank suddenly goes bust, or even the entire Chinese banking system for that matter!? Whatever it is, in the age of computer algorithm driven robo-trading, a little known chink the armor like ETF’s could massively accelerate a crash once it starts to pick up steam. Next, I will explore things that will likely occur following an event that would likely impact every single person on the planet. These are not conspiracy theories – they are things that are actively happening in peripheral countries and will almost certainly happen in big countries shall things start to fall apart. One of the big stories of the year, and of central bank desperation, has been the imposition of negative interest rate policy (NIRP). Negative interest rates basically mean that rather than earning interest on your bank deposits, you lose money on your bank deposits. 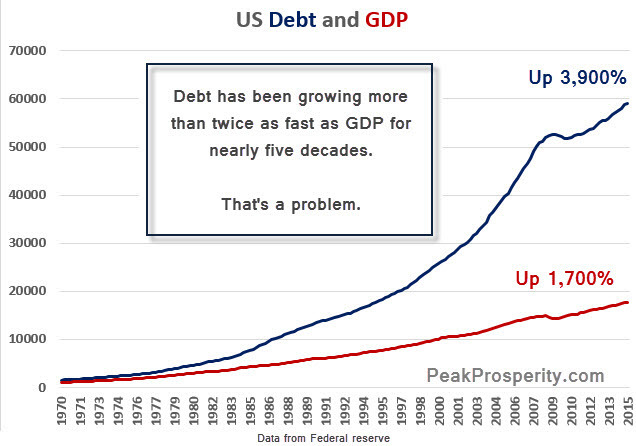 As described in my post Inflation vs Deflation, I explained how central banks fear a shrinkage in the issuance of new debt because it means the current fractional reserve banking system we have falls apart. At the central banking level, negative interest rates operate by essentially imposing a fee on banks that keep money on deposit overnight. The theory is that if they can make it more expensive for banks to sit on cash, then they will be more likely to loan it out to people and businesses. As the theory goes, those people and businesses will go spend it on things in the economy. To be honest, they don’t care that those people are out spending money – they care that those people are taking out loans. Without constant new debt creation, the banking system falls apart. Unfortunately, NIRP doesn’t work. Because banks aren’t completely idiotic and don’t want to just throw away their money to anybody who has no hope of ever paying it back, they still keep their money on deposit overnight at the central bank. So essentially, NIRP becomes a tax on banks, causing the banks become less profitable. To counter this, they then punish their own depositors (you and me) by increasing bank fees, lowering interest payments to effectively zero, or even passing on the negative interest rate entirely. Therefore, not only do the banks feel pressure, the entire population gets punished by this invisible tax. Furthermore, banks such as Deutsche-Bank are starting to go public with their frustration. They claim, rightly so, that NIRP will only make it easier for the system to break down. Without bogging down too much in the details, remember that if your savings accounts begin losing value, that this means the purchasing power of your paycheck and savings will start dropping even more quickly than it already is. 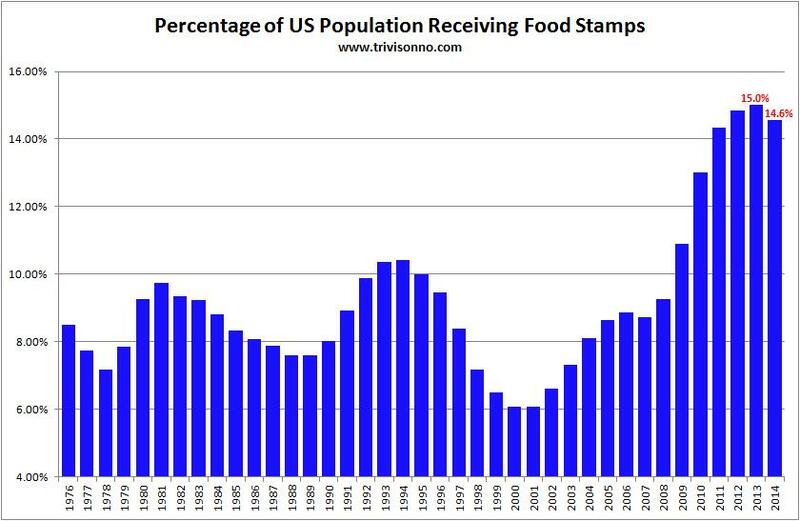 This very much WILL impact every person in the US if the policy becomes implemented. Think this can’t happen in the US? Think again. A Bloomberg op-ed recently just called for an end to cash in the US. CNBC recently had a guest on advocating that the US eliminate $100 bills in order to “deter tax evasion, financial crime, terrorism and corruption.” This continued argument that it would be a measure to fight crime simply does not hold weight. 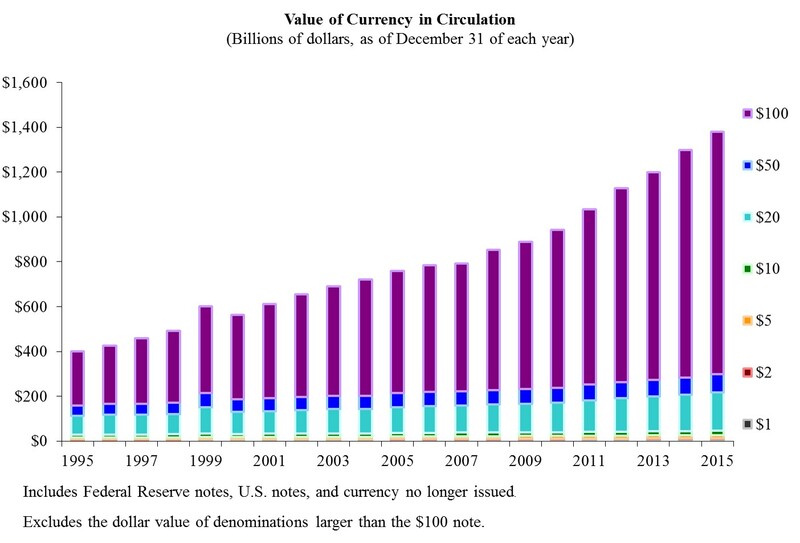 A staggering 56% of all money in circulation in Europe and the US is in the form of 500 euro or $100 notes. Do they really expect everybody to believe that they would render a whopping 56% of all cash in circulation illegal in order to stop a few thieves and terrorists? No, the real reason why central banks want to abolish cash is so that people are forced to keep their money inside the bank. This allows them complete control over the money supply, essentially trapping capital inside of it, and allows them to impose things like negative interest rates and other capital controls without any risk of people running and hiding. It also of course reduces the risk of a run on the banks in the case of a major bank collapse. …the notion is Fedcoin, which is a term not original with me, its something I came across in the blogosphere. JP Koning was the first to coin the term, but basically what this is is the idea of combining the bitcoin payment system, or the protocol with the US dollar. We believe that the fed can maintain the fixed exchange rate system [between the currencies] because the fed [would] ‘print’ both types of currency, and no other private sector [entity] can print dollars, giving the Fed a comparative advantage. Encourage savers to move their savings from cash into digital form, thereby entrapping their capital in the banking system. All the pieces seem to fit so nicely, it’s hard to believe this doesn’t happen. The government and banks get out of paying down all their debt while the savers and general public get trapped deeper under the control of the bankers. People may not realize it yet, but we live at a very critical moment in history. A giant decades-long expansion of debt on a global scale that has outpaced the actual growth in the economy is finally starting to come to an end. Between a crushing level of debt and an increasing scarcity of oil, the cost of production has become too high and the economy is choking. 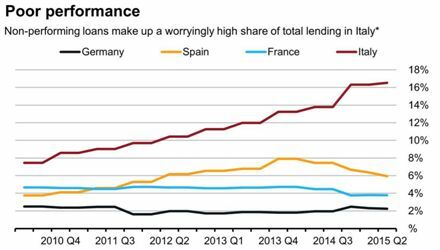 Banks are distressed to the point of insolvency, especially those in China and the “too big to fail” bohemiths like Deutsche-Bank. Computer-driven trading that drives popular investment vehicles like ETF’s will likely cause a mass acceleration of any major market crash, which will make it fast and furious once it starts to pick up steam. Central banks are becoming desperate to save themselves and have started implementing negative interest rate policies around the globe and are actively entertaining the idea in the US. An increasing number of cries from major banks to move to a cashless society aims to entrap people’s capital so the banks can have access to your money when they start facing bankruptcy. Finally, helicopter money is even being floated as a viable option, both in Europe and the US, in order to keep our monstrous debt and consumption driven banking system alive. Of course, none of these measures will actually work, at least not for the masses. It will help the banks weather the storm and survive to see another day, but it will destroy the savings of people like you and me. I found these to be great lessons that are not just helpful in surviving a Great Depression, but also just in leading a better life in general. With that, I leave you until next time! Devastation Happens Quickly, Be Prepared: The stock market crash occurred in October, 1929. 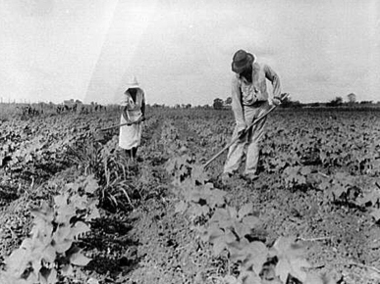 By 1932, a year and a half later, 15 million workers lost their jobs and were unable to find other work. Our economy is now a world economy. Any crash will cause significant ripples not only in the USA, but worldwide. It will happen much faster. Be prepared. You Have No Control Over The Value Of The Dollar: Invest in other assets or invest in yourself and build on your set of skills. Have A Plan For Tough Times: Knowing what you will do when income isn’t coming in they way you expect helps to decrease stress and eases you through a difficult transition. What type of work will always be needed, regardless of the circumstances? A Positive Attitude Sets You Free: My great-grandparents were adults and my grandparents were children when they went through the Great Depression. One set of great-grandparents had a positive state of mind, while the other set did not. While both sets of great-grandparents suffered devastating losses, the set that remained positive didn’t agonize over these losses. They were much better off. Go Local – Family, Friends & Community: The more self reliant your family, friends and community are, the less the effects will be felt. Become Resourceful – Adapt & Diversify: See if you can re-purpose that or maybe you can create value out of that resource. Thinking outside of the box will help you immensely. Skills Are More Valuable Than Things: Many jobs disappeared during the Great Depression and many worldly possessions were, ahhh repossessed. If you have a large skill set, you can better adapt to the times, and no one can take those skills away from you. Become a Do-It-Yourself-er: Learn basic plumbing, carpentry and electrical skills, baking, cooking, herbal medicine, sewing and knitting skills. The next time you need to fix something, do not make a call or an appointment. Fix it yourself. Produce Your Own Food: Think about where your food comes from right now and then think of ways to provide that food yourself. Have a garden, raise quail, chickens or rabbits. Practice these skills now. Waste Not, Want Not: Reduce, reuse and recycle. Before this phrase became a popular saying, our parents, grandparents and great-parents believed and lived the proverb, “Waste Not, Want Not.” My wonderful grandparents always had several toasters and lamps in their basement, they saved plastic bags and twist ties, saved wrapping paper, collected pan drippings (fat) in a can and many other things were re-purposed and saved. Depression-raised children wore flour sack clothing; fabric re-purposed from flour sacks. Think on that a moment and then re-purpose something today.